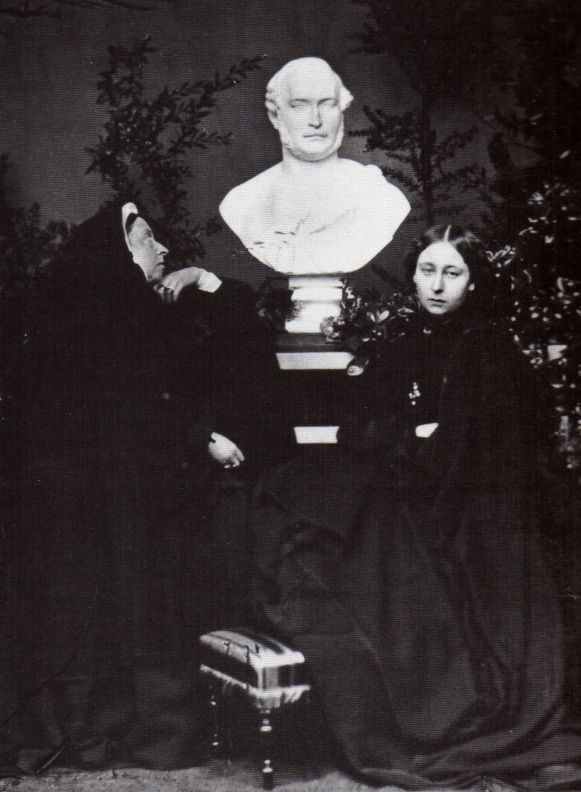 admiring a bust of her late husband. 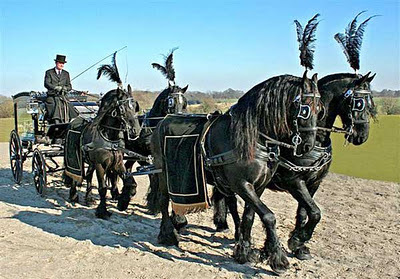 Some of the most elaborate and extravagant funerary practices come from our Victorian ancestors. Enjoy these historical oddities and relish in the fact you are alive now, and not then. So what were “Widow’s Weeds?” It was another name for mourning attire popularized after Queen Victoria’s husband, Prince Albert died in 1861. She never stopped morning until her own death in 1901 and all of the world seemed to mourn with her. The Civil War’s start in 1861, also brought about wide scale death and mourning in the United States with the southern states hit the worst. If you were a fairly well-to-do woman during this time period in England or the United States, here were some basic guidelines of mourning to go by should you find yourself a widow, have a death in the family or find yourself planning a funeral. 1. You are not allowed to leave the house unless you are wearing all black and a mourning veil. Do this for one year if it’s the death of your child. Two years if you have lost your husband. Oh…and if you found you were left with some breathing problems after wearing this garb don’t worry, it was just from the veil you wore. The crepe material had a toxic glue in it that just messed with your respiratory system. No worries though! You’re still alive right? 1860 “Mrs. Howe.” A woman in traditional mourning attire. 2. If you can’t afford a new, black mourning dress, just dye one you already own black. It can always be bleached and dyed again later. Make sure the material has no luster or shine to it. It must be dull as dirt. 3. After one year, feel free to add some jewelry and maybe a few “frills” to your black wardrobe for the next nine months. You are now in what is called, “half mourning” mode. Purple is usually the acceptable color, maybe some mauve. After nine months is up, you can start adding some other colors back into your life. 4. A little confused by all of these rules? Have no fear. Just pick up some of the well liked magazines of the time like, Cassell’s or The Queen and they will steer you in the right direction so you don’t make a mistake during your mourning period. How embarrassing if you did make a mistake! Husband or wife is two to two and a half years mourning. If your child dies and they were over 10 years old, mourning is six months to a year. The same time goes for your parents. If your child was under 10, just mourn for three to six months. If your baby died, just mourn for six weeks and you should be fine. Your aunt and uncle should be mourned for three to six months. Grandparents should be six months and if it was a distant relative, three weeks should suffice. 5. Ladies, don’t leave home without your mourning jewelry! These pieces were typically made out of jet for its black color but other, cheaper materials dark in color also worked. Hair jewelry became very popular during this time. What’s hair jewelry? Take a lock of your dead loved one’s hair and use it in a broach or weave it into a fancy design. Sometimes hair would be braided and made into a necklace or bracelet with a locket on it to put the dead one’s photo inside of. 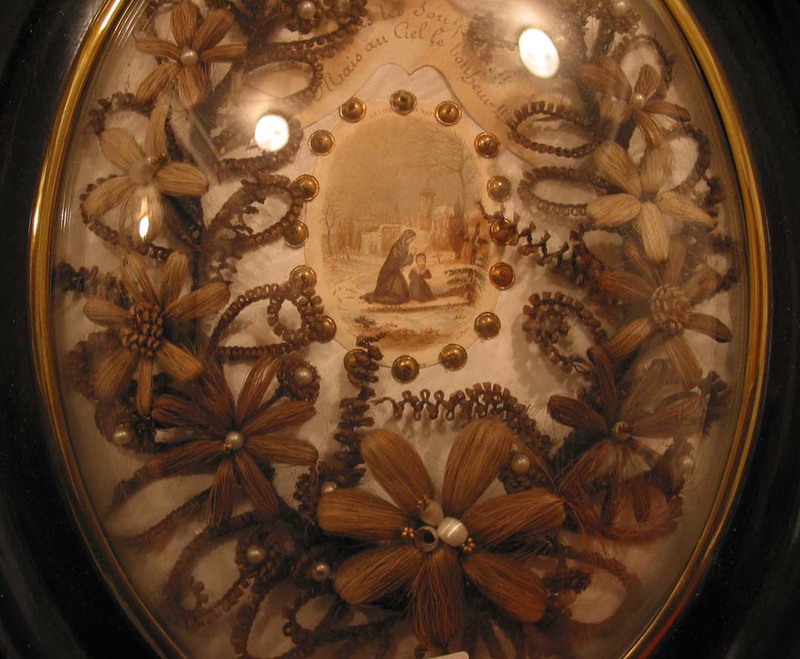 The flowers in this piece are actually made out of hair. Notice the center picture of the two grave side mourners . 2. Tuck a nice black handkerchief in the front pocket of your suit coat or wear your darker suits. Maybe a piece of black crepe tied to your hat. Usually the front parlor or a living room was used to display the body for a few days at the wake. Flowers would surround the coffin and they weren’t just there to look pretty. They also doubled as an old fashioned Febreze to cover up the rotting body in the room. Embalming didn’t come about until after the Civil War. Civil War doctors needed to figure out ways to preserve the bodies of the soldiers while on the field so they could be shipped home for burial, hence embalming fluids and formaldehyde were eventually developed as a bodily preservative. So there the body laid in the living room waiting to be buried, sometimes for days at a time. Imagine if your home was small and only had a few rooms? If the person died on a Monday, they sat in the house that much longer as people preferred to bury bodies on Sundays. So continuing on with your home funeral decorating tips, make sure to hang a specific type of wreath with black ribbon on the front door as well. This was another way to alert everyone in the neighborhood that there was a death in the family. When it came to burial day, it was thought best to carry the body out of the house feet first so the “spirit” couldn’t look back at the home and take someone down to the grave with them. Dead people are just so mean and vindictive like that. 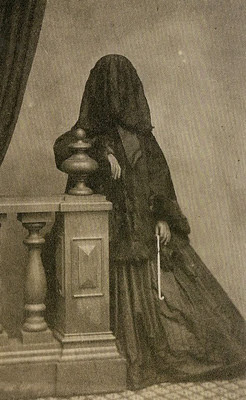 Mourners during the funeral could also prevent a haunting by the dead person if they were cloaked in the regulation black clothing. As for the popularity of the mourning veil, Hoag Levins writes in his article, A Lively Look at the History of Death: Exploring the Architecture and Rituals of Civil War-Era Mourning, that they believed spirits of the departed would hover around those they loved, and if a passerby looked directly at the mourner’s face, that spirit might attach itself to that person. So, the veil was a protection for the wearer as well as a protection for others. 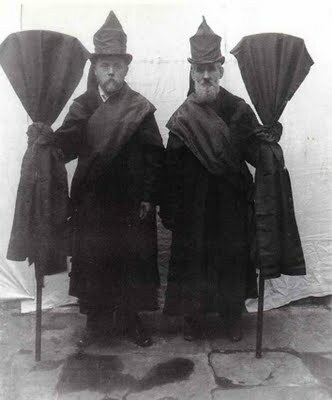 Old photo of Victorian mutes or professional mourners. The Victorian funeral procession was like a grand parade, only really depressing. There were all sorts of characters with the funeral from the pall bearers to people called “mutes” whose official job title was actually “professional mourner.” Their job was to walk with the funeral in silent sorrow in honor of the deceased, usually with exaggerated sadness expressed on their face. Sometimes they would be paid to just stand in front of the house all day, just looking sad and creepy. 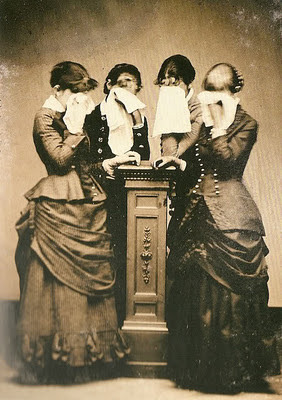 Women professional mourners would cry despondently to get others worked up and crying. 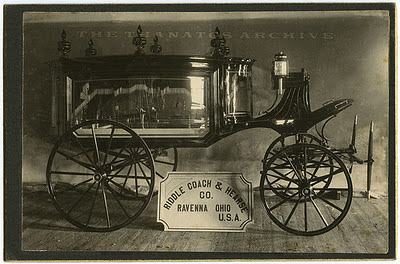 In the U.K., you can still have a horse drawn funeral and glass sided hearse take you away to your resting place. The casket was surrounded by flowers inside the glass hearse. No detail was too small for this event. Many people spent their life savings on an elaborate funeral and whole businesses were developed to meet the needs of every little detail you didn’t know you even needed or wanted. Eventually, the extravagant and expensive funeral practices started to fade away as people realized how impractical they were. After the death of Queen Victoria in 1901, her rigid reign and strict codes of conduct, especially for women, started to fall away and the world started to brighten up. Mourning practices became just another page in history. 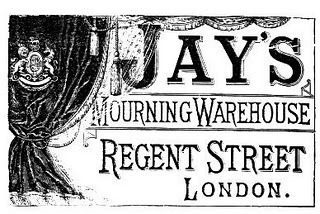 1894 advertisement from The Times newspaper in London. I knew a man whose father died when he was a child of about 10 in the 1950’s in Southampton, UK. They were not a rich family . His mother slept in the marital bed with the corpse of her late husband beside her for five nights until the funeral. They did not belong to any strange sect, there just was no where else for the body to be laid out in a three bedroomed terraced house with eight children and a mum filling every room. I know this is absolutely true, the man told me himself. Oh wow!!! That’s horrible and sad all at the same time. Thanks for sharing that.